Noel: “You must convince me,” Picard growls at the recently self-identified Admiral Jarok, a Romulan who had originally identified himself as a lowly logistics clerk during his defection from the Romulan Empire. Indeed, “The Defector” goes to great lengths to play with our perception of Jarok, and whether or not he’s truly ready to sell out the Romulans, or in fact he’s purposefully leading the Enterprise into a trap. One of my many favorite things about this episode—and it is a favorite of mine from the series—is the construction of its narrative. After consuming so many defector/spy stories across all sorts of genres and on all sorts of shows, you often find yourself pushing against whatever narrative the show wants you believe. So the episode would very much like us to think that he’s a spy; what with the Romulan warbird maintaining a consistent but threatening distance from Jarok’s smaller ship, that he’s not offering up any basic information attached to supposed cover, and that he was lying about his identity and after revealing himself as an admiral, and is hoping to be taken more seriously. Even the impassioned plea about the future of his daughter has the air of manufactured sentimentality, a story that would work well on a human and significantly less well on a Vulcan. What ends up elevating “The Defector” beyond other similar plots is that Jarok himself believed false information, supplied by his higher-ups, and discovers that his defection, his branding as a traitor, was all for nothing. The base on Nelvana III isn’t real, and the subspace radio transmissions and disturbed ion fields are the result of a harmless cloaked satellite. It was all a very long con to get the Enterprise to violate a treaty and go stampeding into the Neutral Zone, and Jarok, telling the truth as he knew it, realizes he was just a pawn in this. 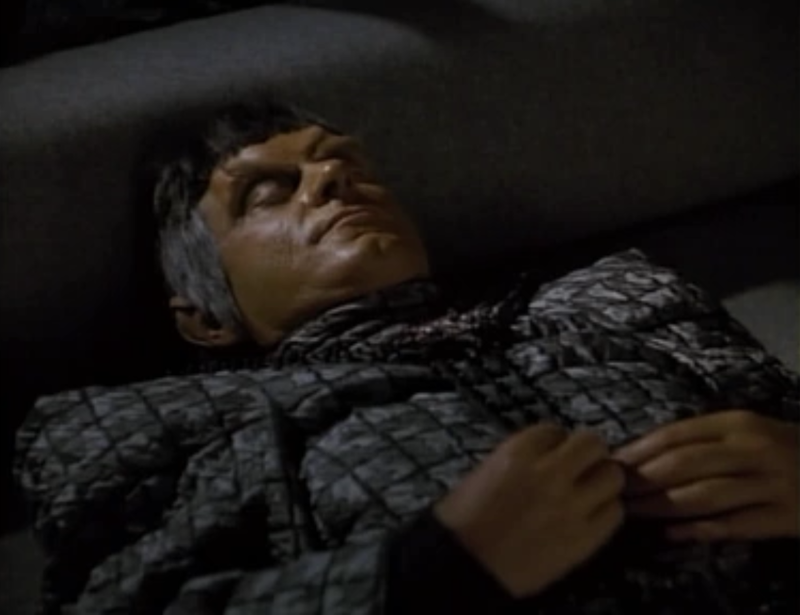 It’d had been one thing for him to become some sort of ambassador or well-cared for POW of the Federation, but instead the episode doubles down on the depressing nature of the episode, and Jarok kills himself and the episode refuses the audience a happy ending. But else what would you expect from Ronald D. Moore? Anthony: Full disclosure: I watched this episode while tidying up around the house. I almost always busy myself with other tasks while watching The Next Generation, rarely giving it my full attention. It’s a background noise show for me, and it always has been. My first viewing of most of the series occurred at my old job, tearing through episodes while sorting archival documents. This isn’t to say that I dislike the show. I’ve seen every episode, I love the overall sense of genuine optimism, and I think its best installments are among TV’s finest. But it has always been my least-favorite of the first three Star Trek shows, largely because I think half of the characters are dull. The Original Series only had three well-developed characters, of course, but the others were all entertainingly broad caricatures. Deep Space Nine was about a community, and all of them felt like family by the end of the series. But TNG has three wonderful characters in Picard, Data, and Worf, plus a bunch of other guys—Riker is a boring version of Kirk without ambition (or Shatner’s offbeat presence), Dr. Crusher is a perfectly pleasant person who only becomes interesting when time or the universe bend around her, and Geordi only stands out because Levar Burton’s speech patterns are burned in my brain from childhood. Troi and Wesley exist also. Since I don’t really care about most of the crew, TNG lives and dies by its stories. That means I’m bored to tears when the characters sit around that accursed conference table and argue about the value of the Space Irish or whatever, but with a good tale, it could soar. Luckily, this is one of the good ones. My favorite moment might be the episode’s last. Noel mentioned that it’s a fundamentally depressing ending, with a despondent Jarek killing himself. That’s true, but that optimism I mentioned earlier comes shining through at the end. 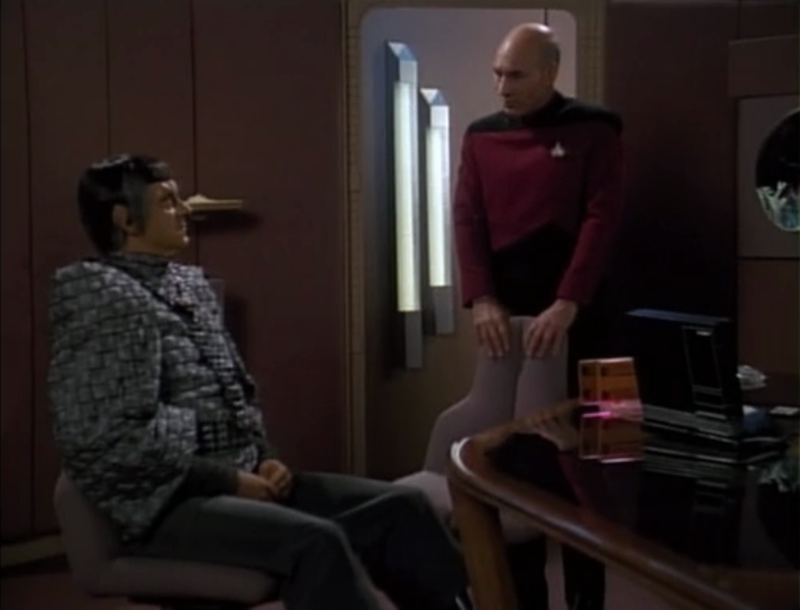 Data notes that they can’t deliver Jarek’s suicide note to his Romulan family, and Picard notes that someday they might be able to, if the two sides come to an understanding. Jarek felt like his defection was in vain, but Picard doesn’t see it that way at all. It was the first step in a process that will make the universe a better place. 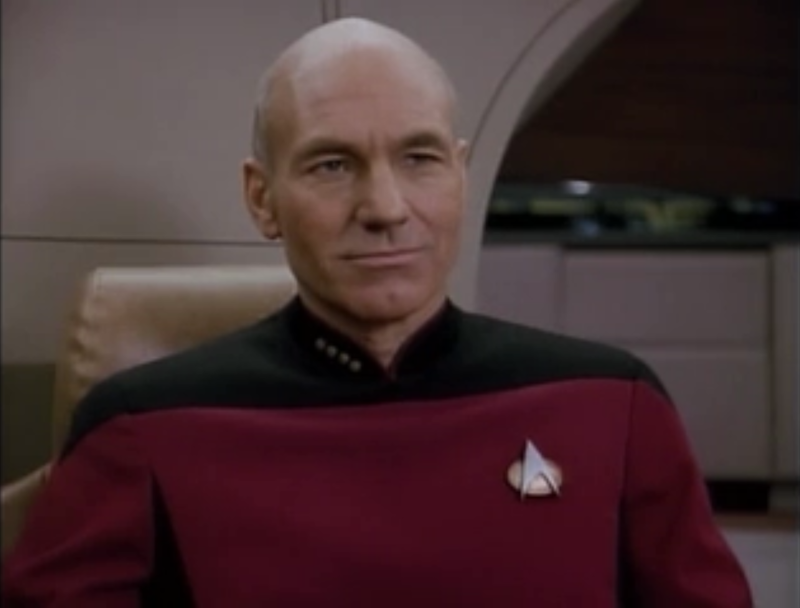 Picard really believes that, and it’s one of the things that make him such a terrific captain. Finally, we can’t ignore that this episode starts out with Data in the Holodeck performing Henry V while Picard gives him notes. This allows for some strong material in the main plot, when Data compares Picard to the Shakespearean king. But more importantly, the scene features Patrick Stewart in a wig and makeup, playing one of the other actors in the program. I can’t help but wonder if Picard programmed that character to resemble him, or if its a leftover simulation from when Picard ran the program himself. That seems like something he’d do. Jessica: As someone who’s fallen in love with The Americans, I was intrigued by the title alone. (And how great would an episode about anti-Federation sleeper agents have been?) And I liked that because Jarok was a prick, you almost wanted him to be lying so you could see him get his comeuppance. I’m not surprised to learn that this was a Ron Moore episode, as that very indictment of the audience in cheering for his downfall only to get the rug yanked out from under you in the most sucker-punch fashion imaginable is the touch he brought to Battlestar Galactica. I think the thing I like about TNG the most is that while the original series would deal with people who represented broad ideas, Next Generation looked at people’s very specific stories and the ideas reflected in the details. The viewer feels they’ve come to know Jarok by the end of the episode, his pride and preening vanity turning out not be a cover for a spy but the poses a traitor is working overtime at to convince himself his actions are right and just. All of it making his suicide all the more devastating. If there’s a tragedy to Jarok’s story, it’s ours too, in that how often we fail to see the heroism in those we dislike or even in ourselves. Heather: I have never watched Star Trek before. I saw pieces of one episode in 1999 and greatly enjoyed the rebooted film, but I never took the time to invest in the television series. So it was with newbie eyes that I watched “The Defector.” I enjoyed the episode more than I thought I would. I found it refreshing. So often television shows rely upon action scenes and explosions, fights and violence to hook viewers in. I liked that this episode spent most of the time talking. (Given Anthony’s comments, maybe this is normal for TNG?) Picard didn’t rush into a conflict; he valued the process of acquiring the appropriate information before he made any final decisions. That’s a good leader. Thanks to Jessica for making the Ron Moore connection between this episode and BSG. Throughout the episode I kept noting aspects and interactions very similar to those in BSG. The strained, suspicious conversation between Picard and Jarok, for example, reminded me of countless conversations between Boomer and Adama. Both Boomer and Jarok possess deep loyalty to their race, yet they both also choose to “betray” their respective peoples for the sake of something larger. I liked that about Jarok. It wasn’t a simple case of defection, like so many episodes of the original Mission: Impossible series portray. It was a bitter defection filled with regret, heartbreak and a tremendous sense of loss. This defection was not based upon hate towards his people; it was not an action to better his own future. (Two of the conventional reasons for defection, as shown in television.) It was for the future of his daughter and perhaps ultimately his whole race, as well. Les: As I mentioned back when we discussed “Arena,” I’m a relative newcomer to the Star Trek franchise, so I’m incredibly pleased that the two installments selected for this roundtable have been installments that will get me to watch more and more episodes of each series. “The Defector” was a wholly satisfying hour of TV, one that played with our expectations for the entire run time. Noel’s already praised the construction of the narrative, but I’ll reemphasize how much I respect the episode for keeping the truth hidden from both the Enterprise crew and the viewers for as long as it does. We’re never quite sure until the end just how sincere Jarok is in his convictions, and even when we learn the truth it contains another twist when we see that it was all a feint by his superior officers. 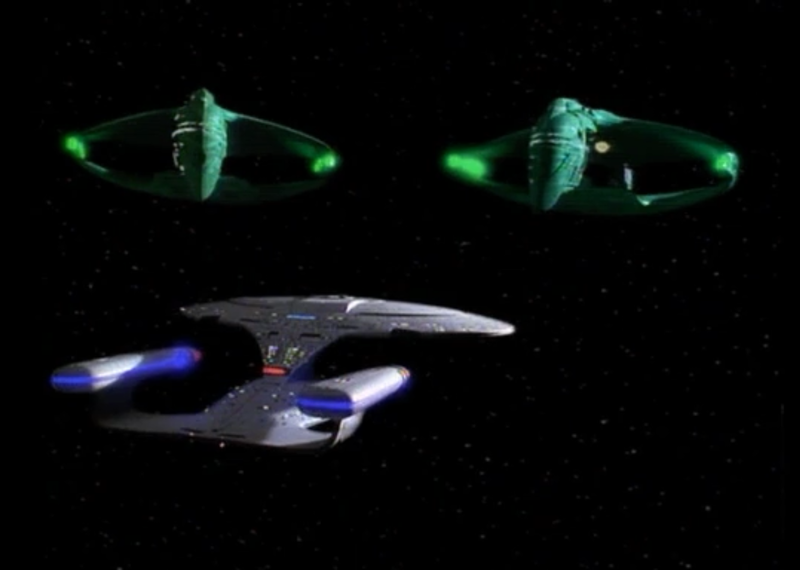 I also found it quite fitting that the Enterprise and Starfleet Command never communicated with each other directly, only by pre-recorded messages, and both sides are operating on intelligence that in the few hours it takes their message to reach the other could change entirely, a detail that nicely heightens the tension between communiques. And while I know that one episode of each series isn’t enough to base an argument on, I want to throw my argument into the age-old debate between Kirk and Picard and voice my support for the latter. I enjoyed William Shatner’s performance and recognize how much fun he’s having in the role, but Patrick Stewart just lends such gravitas to every role he plays that he makes Picard the easy choice for the man I’d want leading me into uncharted territory. 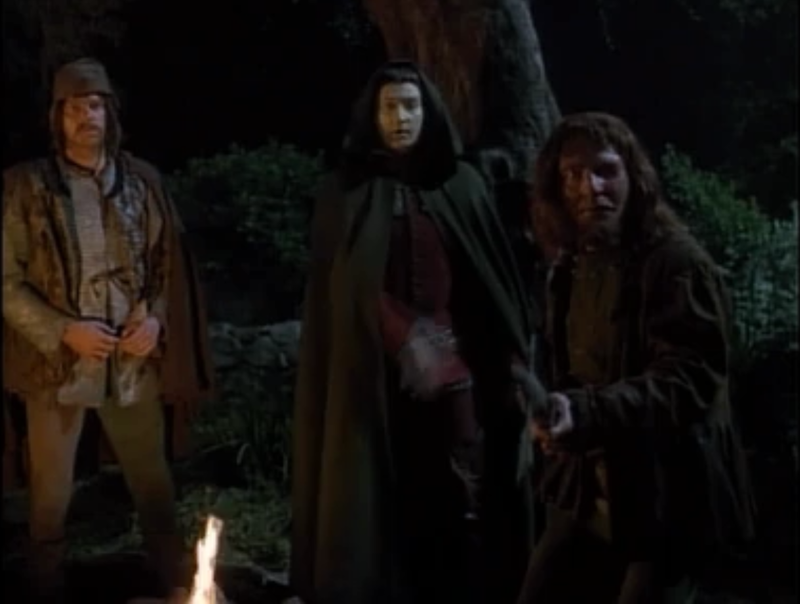 It’s fitting that the episode began with Henry V, because it both amplifies the Shakespearean attributes of Stewart’s acting and plants the seeds for the leadership decisions he’ll make at the climax of the episode. 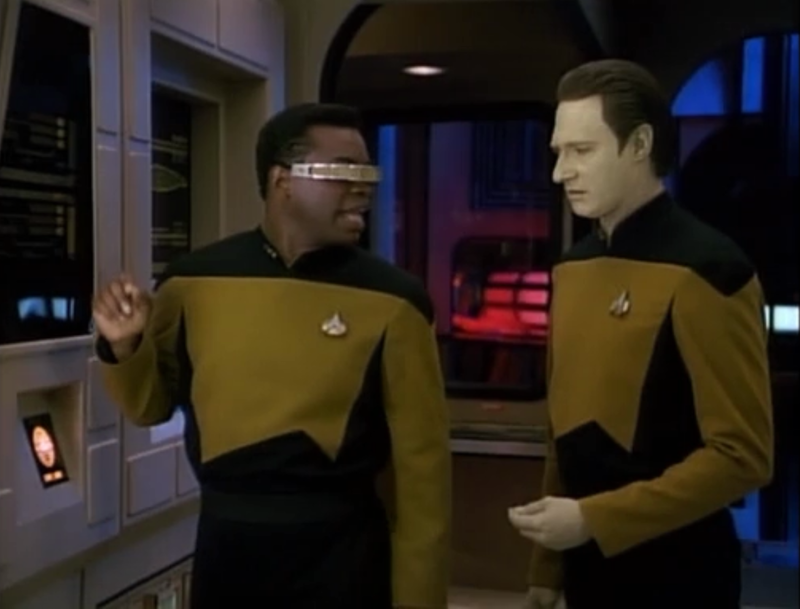 Two scenes that stuck out to me within “The Defector.” The first one is the scene between Data and LaForge in the engine room, where LaForge is trying to explain the difference between gut feelings and cold facts. It’s a touch on-the-nose as LaForge walks through how they’re both necessary to make a decision, but it fits into the problems of the entire situation. 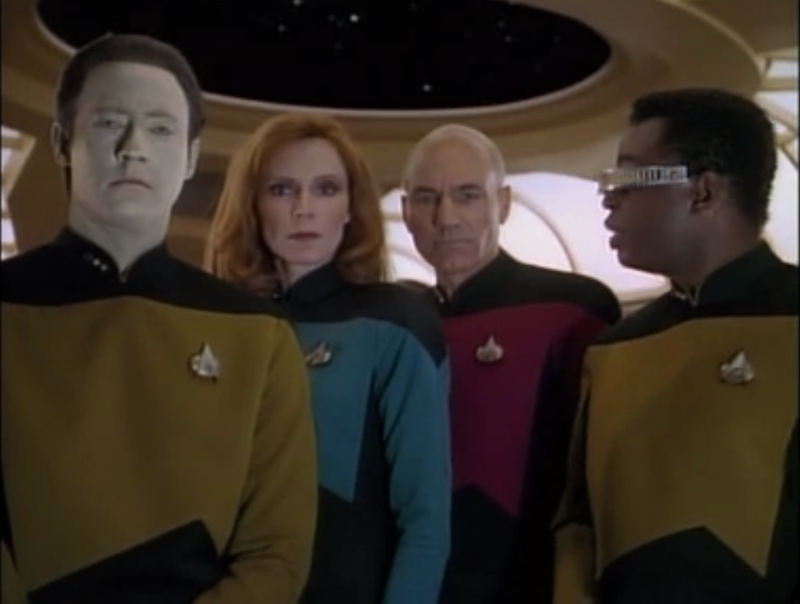 And Brent Spiner is terrific as Data, adding just enough humanity to his android performance that what could be a cold and calculating persona manages to come across as merely inquisitive, and capable of making such decisions as sending Jarok to the holodeck logical with a pinch of empathy. J.: I’ll also cast my vote for Picard in the never-ending captain’s debate, though I’ll say that Picard has quite a few moments of stone cold badassery himself in “The Defector,” namely when he stares down Tomalak and says, “Are you prepared to die today?” Sure, he knows he’s got an ace in the hole with his secret Klingon backup, but it’s still a gambit that requires nerves of steel. Picard wouldn’t join his officers’ weekly poker game until the final scene of the series, but I think it’s safe to say he’d clean them out pretty easily. What I love about this episode is how brilliantly it executes its through line of deception. 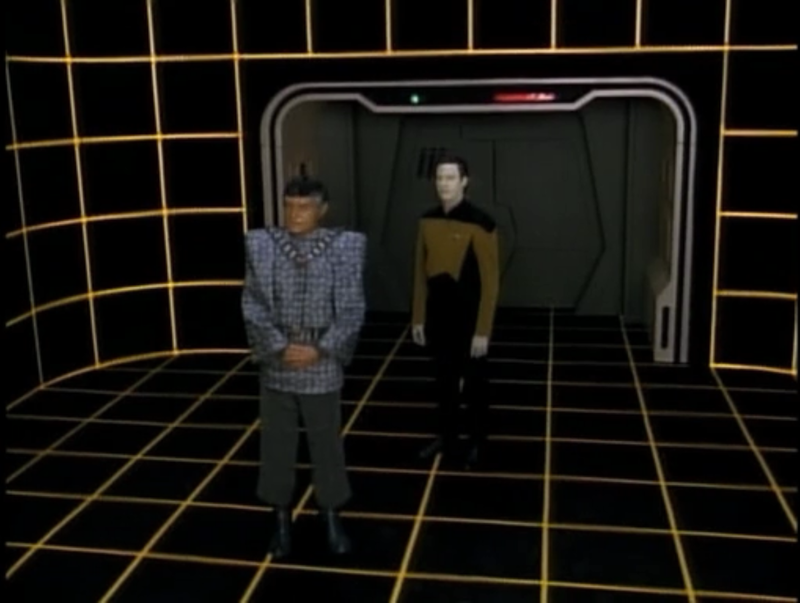 It’s important that we begin with a scene on the holodeck, watching Data pretending to be Henry V pretending to be someone else. Jarok is acting, the Romulans are acting like they’re acting, and Picard is a step beyond all of them, not sharing his true plans even with the audience. Like Geordi explains to Data, we fill in the blanks with our own personalities, and everyone guesses wrong. Cameron: The unfortunate consequence of being a) the last person to comment b) in an already packed roundtable is that everything I want to say has pretty much been said. So I’ll gladly echo my comments from “Arena” because they apply just as well here. Not necessarily the science of science fiction stuff (Ron D. Moore developed some sort of allergy to technobabble after Deep Space Nine, which informed the writing of the reimagined Battlestar Galactica quite a bit) but the concept of diplomacy in action. Especially for these first two Trek shows, written in the middle and at the end of the Cold War, seeing contemporary politics played out in futuristic settings makes for an exemplary look back at how we handled international relations in the post-World War II era. 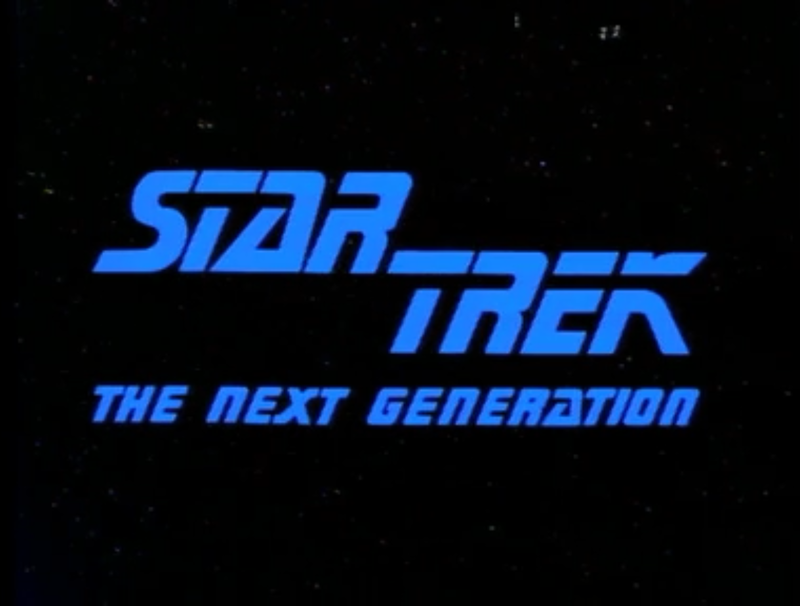 And that’s ultimately what I love about (nearly) every Trek series. It doesn’t really matter to me if Kirk or Picard is the better captain; what matters is that they’re both written as diplomats and envoys first, warriors second. The process of deliberation, the mental exercise of navigating treacherous boundaries (literally as well as figuratively in this case), is what I’m attracted to most in television, as opposed to shows that establish clear good-and-evil parameters as if all negotiations can be handled that way. So in the end, this goes back to Noel’s quoted line: “You must convince me.” It’s down to poor Jarok, who believed beyond reasonable doubt in his information, only to be betrayed by his own people for the sake of wanting to start a war. In a way, the Romulan method of testing their enemies is representative of the series as a whole: testing its crew to their very limits, and testing its audience to see how close to reflecting the reality of its time the show can get. We were, however, deprived of Wil Wheaton. How did that happen? Well, we could have picked a *good* Wesley Crusher episode, like “The First Duty,” another fantastic Ron Moore script. Wouldn’t have really fit the “space” theme, though, since it takes place entirely on Earth.